“I choose to be an artist. There was something for me about creating objects and putting them out into the world where people could experience movement and to see that change in the world,” said Ken Gonzales-Day, visiting artist and creator of the Shadowlands exhibition in DePauw University’s Peeler Art Center Gallery. 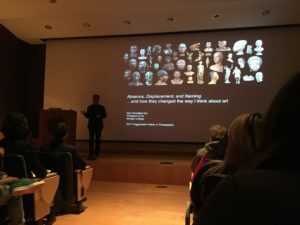 Gonzales-Day gave the lecture entitled “Absence, Displacement, and Naming … and how they changed the way I think about art,” where he spoke broadly about his artwork as a form of retelling often untold or missing narratives, Tuesday evening. Professor of Photography Cynthia O’Dell introduced him, saying that much of DePauw’s faculty has been “very much awaiting his arrival.” And the numbers of students in Peeler’s completely full auditorium, spoke to that very much. Several students had to sit on the floor and stand in the back just to attend the lecture. Gonzales-Day’s lecture focused on three main themes: absence, displacement, and naming. He wants people to think about missing histories, the ideas of othering, and the use of language when looking at his work. Much of Gonzales-Day’s work is the result of primary source research in the form of newspapers throughout the California area to document the cases of lynchings of latinx people. Often Gonzales-Day found that the research that existed in novels was incorrect. “All the books were wrong, because no one cares about latinas,” he said. He focused on latinx lynchings because during the time period when the lynching were occurring and being documented, many latinxs were classified as white and so their suffering was erased in a historical context. Professors from all disciplines were also enthusiastic about hearing what Gonzales-Day had to say about his artwork. 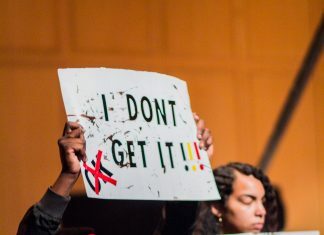 “Gonzales-Day’s work is a vital part of a long tradition of resistance to racial violence and white supremacy by artists of color in the United States,” said Karin Wimbley, professor of English. Gonzales-Day’s exhibition ‘Shadowlands,’ which has his works from the ‘Erased Lynching,’ ‘Searching for California Hang Trees,’ and ‘Run Up’ series is in Peeler from Nov. 14 until Dec. 15.